Donald Trump does not believe in climate change. Well actually, to be more precise, he considers it a ‘hoax’ concocted by the Chinese to undermine U.S. industry and trade. Something China has swiftly rejected, of course. To the average individual these are nothing but the ravings of a mad man; and it really isn’t the weirdest thing out there, especially when you consider that some people still believe the earth is flat. I am deadly serious, they even have their own society. Normally, we would just laugh and ignore such comments. However, when this opinion is held by the President of the United States, this becomes an issue for us all. This is because the U.S. is one of the single largest emitters of greenhouse gases in the world, and its growing economy relies on many unsustainable energy sources and raw materials. The modern capitalist regime is a marvellously insatiable thing. Recognising these issues, and the scientifically proven global impacts of man-made climate change, the Obama administration and China recently both signed The Paris Climate Agreement; now making the total number of countries involved 194. This treaty is an international agreement to combat and adapt to the effects of climate change, with the over-arching aim of limiting global average temperatures to no more than 1.5 Celsius above pre-industrial levels. A certain amount of flexibility has been afforded to developing countries as it has been recognised that these changes will take longer for them. However, as part of Donald Trump’s election campaign, he swore to withdraw from this deal if he should win; even stating he would go so far as to withdraw all U.S. funding from all UN Climate Change programmes, and re-direct these funds to domestic infrastructure projects instead. Pipelines, drilling and coal mines for everyone! Hoorah! Well, we all know he won the election, but does his new power as President mean he can now just ‘up and leave’ an international agreement that took almost 20 years to negotiate? Issues here arise on the basis that any party to the deal is bound for at least four years from ratification, so an immediate U.S exit would theoretically not be possible. Obama must have therefore thought it a smart move to swiftly conclude this agreement in his last days in office – and you can see why. This seems like an ideal safe guard, no? Four years is a long time, and the entire political ethos could have shifted by then! Dare I say, another presidential election may result in a far less orange candidate the next time round. However, there is a slight loop hole. In a real ‘kicking and screaming’ way of showing complete disregard to the global community, Trump could initiate the U.S’s withdrawal from the whole United Nations Framework Convention on Climate Change; the body implementing the Paris Agreement. This would take one year to take effect, as opposed to four, and Trump could then just ‘vaguely adhere to his obligations’ under the treaty until then. This would obviously be a damning blow for the global fight against climate change, and the effect of such a decision could also lead to a devastating chain of events. The large emission-producing economies, such as China and India, could then also seek to leave the UNFCCC, in an effort to avoid being ‘undermined’ by the uninhibited U.S. economy. Additional concerns also exist as some believe it would be unlikely these countries would ever commit to such an agreement again if they were to do so. Emotions are also running high as recent articles have stated that Trump could be intending to leave the agreement within days. This fear is well warranted when you consider the litany of recent ‘executive orders’ he has signed which show no regard to the Paris Agreement’s objectives; including approvals for the controversial Keystone XL and Dakota Access crude oil pipelines. 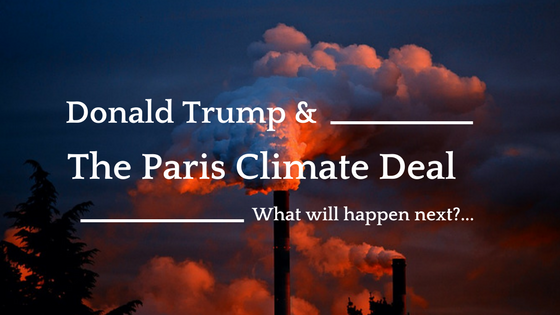 In fact, in complete mirrored opposition to U.S.’s obligations under the Paris Agreement, it is clear to see that Trump is putting unsustainable, polluting fossil fuels at the forefront of his U.S. energy policies. Trump’s policies reflects the negative effects of a modern capitalist regime, which will tend to pursue short-term profit and economic growth, over green and sustainable long-terms goals. His actions, although shocking, should not come as a surprise to anyone, as these are all things he promised to do if he were to be elected president; as found in his ‘Contract with the American Voter‘. One thing I will credit Donald Trump for is that he sticks to his promises – something I believe really explains why some people voted for him. I can honestly empathise with some of these individuals who feel failed by a system which, to them, involved decades of politicians ‘dancing around their promises’. Now I am not saying that I support their decision, or believe Hillary would have been a better option, but I can empathise with the reasons for why some individuals voted the way they did. But back to the Paris Agreement! In terms of the future, I feel that Trump’s reliability will proceed him, and by some means soon, he will attempt to leave the Paris Climate Agreement. But what will be the result? Well as a result of its unimpeded investments in infrastructure and domestic fossil fuel production, the U.S. may just get the economic prosperity Trump so desperately craves. Many pockets will be filled, and many jobs will be created. Whether or not these jobs are sustainable and long-term, or only around so long as construction is being undertaken, is currently being debated. Furthermore, whether the people will see any of this capital re-invested in them, has not been clearly stated as far as I know. There will also of course be the inevitable environmental impacts, though whether this will be mitigated by the Trump administration in anyway is unclear. This is because Trump’s cabinet nominees comprise of mostly climate change deniers, who have strong links with energy companies, and are known for openly lobbying against climate change initiatives. One thing that is certain is that Trump himself has a lot to gain from this, seeing as he owns stocks in a number of these energy corporations. And are we really surprised? Yet all things considered, there is something behind Trump’s logic that I do not understand, and that is his ignorance of the detrimental long-term economic impacts of such policies. This is because I feel that, surely to increase a nations dependency on a finite energy source is to set that nation up for inevitable systemic collapse when that source runs out? If only the U.S. were part of an international climate agreement that would mitigate this… Oh wait! Many corporations have acknowledged issues such as this, and have in fact implored Trump to remain a part of the agreement, raising many other concerns in the process. Other corporations who support the U.S. remaining in the Paris Climate Agreement include Ebay, GAP, Nike, Tesla, Pacific Gas and Electric, Hilton, Unilever, Virgin, Monsato and Kellogs. The full list can be found here. What exactly will occur at this point is just speculation, but not for long I fear. The potential outcomes discussed, even if mitigated, will result in a devastating blow in the fight against climate change. Let’s hope that other countries do no follow suit on such ludicrous environmental and energy policies, and hold strong against the temptation of achieving profit, over a sustainable future. Great piece Carmen, though of course very depressing.